Chris Angulo always wanted to run a company. He studied business administration at California State University San Bernardino and then returned to the eastern Coachella Valley, where he sold cars and then helped manage a manufacturing plant. But it wasn’t until he met Sergio Ramirez, a contractor, that he knew he’d found his business partner. 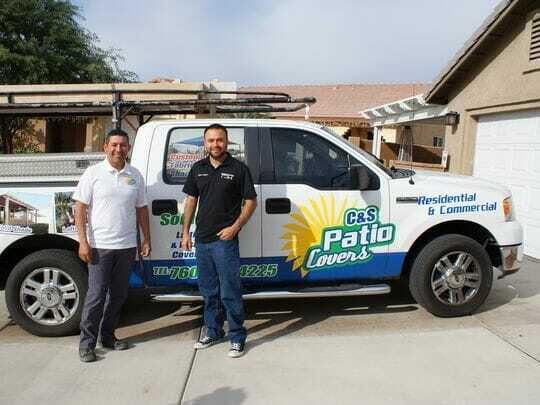 Ramirez, a Mexico City native who came to the U.S. in 2002, saw potential in specializing in patio covers — projects could be done quickly, teams could be small and profit margins could be big. There are about 6,600 construction companies in the Inland Empire, according to census data; three out of four of them have fewer than 10 employees. Plus, the idea lined up with a statewide spike in home renovation— remodeling spending jumped 16 percent from 2015 to 2016, according to the California Association of Realtors. Angulo got his contractor’s license; Ramirez already had most of the tools they needed. Each man put $2,000 into a business bank account. In July 2015, they made a Facebook page and started knocking on doors and going to swap meets. Almost three months later, they got their first job — and established profit margins close to 100 percent.